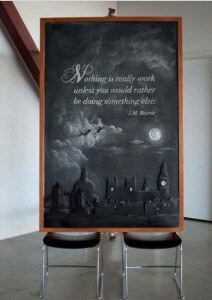 “Visual Canvas, Chalkboard Riot” has incredible art, all done with chalk, chalk dust. and erasers. Each one includes a saying, from Mark Twain, Dr. Seuss, John Lennon, Coco Chanel and others. Impressive!